Bind books faster than any semi-automatic double loop wire-o binder on the market. It has a lightning fast cycle speed, allowing an operator to bind up to 1,500 double loop wire books per hour. The R-422 will bind wire-o books with diameters of 5/16″ up to 1″ and is especially productive on thick books. Rounded closing bars produce perfectly symmetrical wire bindings. Just put the book on the table, place it next to the side guide, and step on the foot pedal. The machine cycles instantaneously. The R-422 is equipped with a patented device which turns in the end of the twin loop wire to prevent anyone (especially children) from getting scratched. 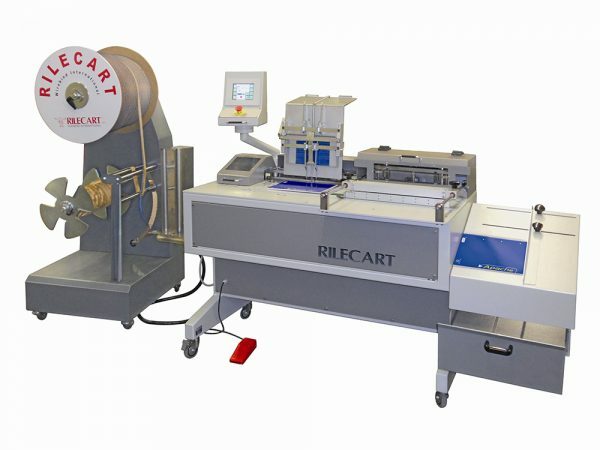 Economical, entry level double loop wire binding machine. It will bind books at speeds up to 800 books per hour. The machine will insert any double loop wire diameter between ¼” – 1¼”. The WB-450 automatically cuts the double loop wire to the proper length and delivers it to the inserting station. The operator hangs the book and steps on a foot pedal. The book is then moved automatically to the closing station where the wire is crimped. The book then falls onto the hopper. The WB-360 will bind books from 2″ – 17.7″ on the spine length. No tools are required. An optional calendar feeder is available.